Live or work near the City and want to sing or find out more about singing in a choir? 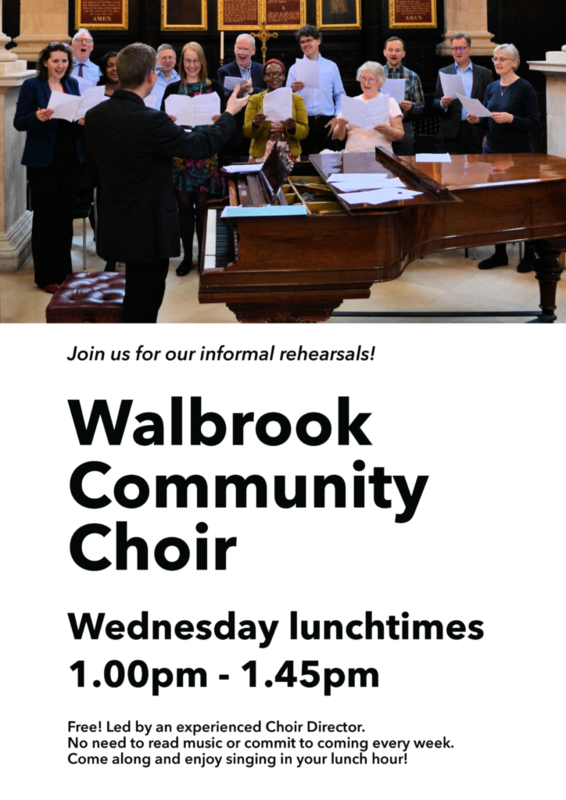 Then join the Walbrook Community Choir! Come along to our informal rehearsals on Wednesday lunchtimes from 1pm-1.45pm. No prior experience of singing in a choir necessary – nor do you need to read music or commit to coming each week – just come whenever you can. Led by Tom Shorter, an experienced Choir Director, we learn different pieces of music together in a relaxed, friendly environment. Since launching in September 2018 we have already appeared in a World Premiere with Cantata Dramatica and sung for a special WW1 Centenary Service. The Community Choir meets every Wednesday Lunchtime at 1pm, occasionally taking a break (check our Events calendar for more information or contact the parish office).